New Marketing Data: What Are Your Email Metrics Hiding? Someone opts into one of your email lists because they think your content, products, or services might be of interest to them. When they start receiving your emails, they open them. (Or at least most of them; after all, everyone gets overwhelmed by email every so often.) Ideally, your excellent content will convert them into a customer in short order. But say your subscriber doesn’t convert right away. Maybe they even start to feel like you’re sending too many emails, but they still want to keep in touch. So they click the handy “Update Subscription Preferences” link that you’re certain to include in every email and adjust the frequency downward—maybe to once a week. That should do it, but in a worst-case scenario, say your subscriber actually stops being a part of your target audience. Maybe you run a dating site and they get married; maybe you market to small business owners and they retire. In this case, neither you nor the subscriber benefits when they remain on your list. So they simply unsubscribe. Given all that, your subscriber count is a pretty good reflection of the size of your email audience. On the flipside, your unsubscribe rate indicates the (hopefully small) percentage of people who have tuned you out. Well, not exactly. In fact, a survey we conducted this month reveals that fewer than half of U.S. email users can be expected to behave according to this rational model. At LeadPages, we specialize in super-effective list-building tools—but we also know that who those leads are and how you follow up with them make a huge difference to your ultimate success rate. And while email list size is an important metric for nearly any business, we wondered: how accurately does it reflect the size of your actual audience—the number of people who are really paying attention? Now let’s tease apart the insights hiding in the chart above. Key Stat: Only 40% of people will actually unsubscribe from a list when they’re tired of getting emails. That’s plenty of people, but it’s definitely not a majority. This indicates that for every person who hits “unsubscribe,” there’s probably another one who’s tuned you out long ago but hasn’t done anything about it. On one level, it’s frustrating. But on another, it represents an opportunity. Some of those hangers-on may be able to be brought back into the fold of active subscribers. Key Stat: Only 3% of people annoyed by too much email will update their subscription preferences. It’s all or nothing for the vast majority of email subscribers—almost none of them will take the time to explore getting less email, rather than opting out of or disregarding all email. What to do? You can start by making clear to subscribers that they have options. Try adding two or three different subscription frequencies to your opt-in forms, or offering the ability to get only certain kinds of content. You might also consider offering subscribers the ability to switch lists by adding a LeadLink directly in the body of an email. Give subscribers a heads up that they can change their email options simply by clicking the LeadLink that applies to them. Yes, these modifications require a little more setup from you up front—but it’s likely you’ll ultimately retain more of the subscribers you worked so hard to attract. Key Stat: 44% of uninterested email subscribers become dead weight on your list. What’s the harm in letting them hang around? For one thing, many email service providers charge you according to the number of email contacts you have in your database. If you’re paying for 50,000+ contacts but only 35,000 of them are actually paying attention, you’re wasting a significant amount of money. For another thing, your open rates really suffer when your list contains a lot of dead weight. It’s harder to measure the impact of any given email when you never rise above a 10% open rate. And if you have to present your metrics to other stakeholders within your business, a list like this doesn’t look great. The remedy? Clean house periodically. Run a report inside your email service provider to see who hasn’t opened an email recently—say, within the last 60 days. (The exact time period you use will depend on how often you email and how long your typical sales cycle is.) Then, remove those contacts from your list. If they get interested again later, they can always come back. But these phantom subscribers aren’t doing you any good where they are now. Key Stat: 9% of people who stop being interested in your emails will actually mark them as spam—even if they were interested at one time. This one’s pretty scary. The more people mark your emails as spam, the likelier email clients are to believe that all your emails are spam. 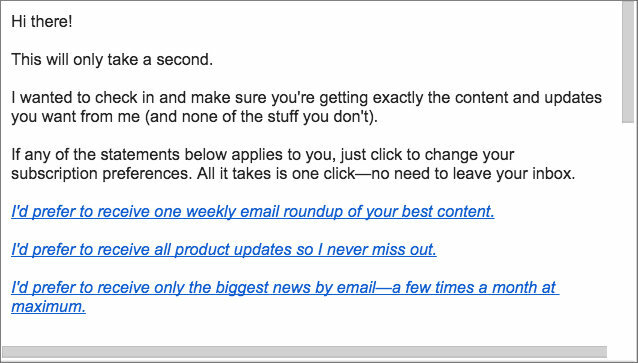 Yes, even if the spam-flag-happy subscribers actively signed up for your email list in the first place. Even if you gave them ample opportunities to opt out. Even if they were glad to read your content until a month or two ago. You definitely don’t want this to happen. And while you can’t control what people do in their own inboxes, you can try to exert a little influence. From your welcome email onward, try to build a more personal, emotional connection with your subscribers. See what happens if your “From” field has your own name instead your business name, or if you add a personal signoff. If that doesn’t make sense for your business, make sure to regularly offer content and other goodies that are so valuable, subscribers will want to stick around just to see what’s next. Either route makes it less likely that people will mark your perfectly good emails as spam out of spite or carelessness—you’ve built a connection they won’t want to break. Key Stat: 4% of uninterested email subscribers mark emails as read (without actually reading them). Confession time: I’ve been known to do this. And I do it most frequently when the emails come from someone who has used one of the connection-building tactics above. For one reason or another, I just feel kind of bad about sending someone’s email to the trash or removing myself from the list. I’m in the minority here according to these survey results (perhaps because as an email marketer, I know the pain of losing subscribers). It probably doesn’t make sense to spend a ton of time working to reach ambivalent subscribers like me, but happily, it may not actually take a lot of work. The second strategy is to send a dedicated email to people who haven’t opened in a while before dropping them from your list. I think of this as the “do you really like me?” email, and I’ve heard from lots of marketers who’ve found it effective in boosting their open rates. The idea: disarm subscribers by putting your cards on the table. You’re sending emails; they’re not engaging. What’s up? You can ask them to write back to you and explain, offer a quick survey to help you understand what they don’t like about your content, or try something different. Simply showing that you care can help remind subscribers that there’s a real person with something interesting to say on the other side of the screen. Key Stat: There’s an interesting generation gap in how people handle unwanted emails. Instead of unsubscribing, seniors prefer to delete emails without reading them. What does this mean for you? Probably not a great deal—but if you know that you do serve an older audience, you may have even more tuned-out subscribers than these stats on the whole would indicate. It’s especially important to consider cleaning up your list. And as psychologically difficult as deliberately dropping subscribers may be, it’s a chance to reassess your marketing efforts. When you do, take a look at who’s not really listening. Have they moved out of your target demographic? Has your content started missing the mark? Should they even have been on your list in the first place? Once you know, you can start improving—and feel truly proud of the number of new subscribers your lead-generation campaigns attract. How would you have answered the survey question? Tell us in the comments.